What do you do when you see a homeless person on the side of the road? How do you react when you hear about violence in Syria? What is your response to the overwhelming scientific evidence that humans are the result of the dangerously changing climate? For any number of social sins in our world–a list that would take days to compile-it is impossible for us not to respond in a way that reflects our own social consciousness. (Even doing nothing, outside of shear ignorance, reflects a support of the status quo.) What I have before you today are five stages of response reflecting our level of social consciousness. Because there are so many issues, we will inevitably find ourselves in multiple stages at once, very conscious of one issue and very indifferent about another. What is important is that we allow ourselves to be vulnerable to the world around us, open to conversion wherever necessary. The weakest response we can have is indifference. Eh, who cares? That doesn’t affect me. At its most basic (and very understandable) level, we recognize that our minds and hearts simply cannot care for every issue under the sun, and while we know that it is happening, even if we wish it wouldn’t happen, we cannot spare even our sympathy lest we be stretched too thin. For many issues, I find myself in this stage as a defense against burnout. How can I spend my day thinking about human trafficking, immigration reform, AIDS in Africa, sweatshops in Asia, poorly educated schools, the fight for a living wage, the privatization (and immense profit) of prisons, political corruption, AND pollution? One person simply cannot be the defender of all things and so we willingly, though unfortunately, choose to remain unaffected. Indifference is less understandable, even sinful in itself, when we attach ourselves to incorrect ideologies or facts so to negate the need for a response in the first place. Poor people are lazy. Climate change is a hoax. AIDS was sent as punishment from God. Immigrants are lesser people. Indifference in this respect is dangerous and hurtful, reflecting a level of social ignorance towards our brothers and sisters. As issues become more personal, usually through a direct experience in our lives, we may find ourselves responding with some emotion. For many of us, I think the perfect example of this is the “pennies a day” commercial we see on television: showing images of children living in destitution, how can we help but feel sorry for hungry children? At this point, our knowledge of an issue has moved out of the intellect and into the emotion: we see something tragic and we respond by showing pity. Wow, I didn’t realize how hard those people had it. I feel really bad for them. Because the experience has touched us in a new way, we might even be moved to give something of our own, a donation of money to the organization or a dollar to the homeless person, to help alleviate the problem. On the other hand, emotions fade, and as the commercial ends, so might our pity. The reason for this is that sympathy, while it might move us to help another (a very good thing), it will not move us any closer in relationship with the other because sympathy focuses exclusively on the situation of the one suffering, investing nothing of oneself. As a result, the relationship will only ever be one direction: the suffering receive pity from us while we remain virtually unchanged. What shows a greater connectedness to our brothers and sister is empathy, the ability to understand and share the feelings of another. 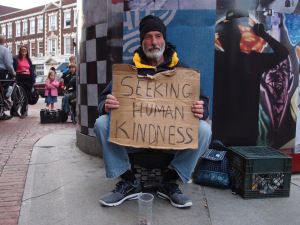 When we see homeless people on the street, do we feel bad for them, or do we place ourselves in their situation to know how we would feel in their place? Wow, I would be in a bad mood too if I slept on a bench in the rain last night. Knowing how cranky I get when I miss a meal, I would be a wreck if I never knew where my next meal was coming from. What is so critical about this stage is that we begin to recognize the common humanity in the other. By introducing ourselves into the situation, connecting our experience with those before us, we allow ourselves to be moved by those we serve. Something in us has changed, and something in our relationship has changed. The homeless man is no longer some nuisance on the street, he is a brother in Christ living in a way that we can no longer bear to see because we can feel his pain. When we reach this stage of consciousness, we simply cannot turn back to indifference. Something must be done to help. As empathy grows, so does our self-reflection. How am I related to this issue? Have I contributed in some way? Is there something that I can do in my own life to stop it? If we truly put ourselves in the place of the suffering, sharing in their pain and allowing ourselves to be moved with great humility and vulnerability, we begin to realize that we are not completely innocent to our brothers and sisters’ pain: the way we live contributes to the social structures causing injustice. We’re not responsible for human trafficking! Yes, but we did buy jeans from the store that is uses child labor. We care a lot for creation! Yes, but we also eat three times the amount of meat the rest of the world does and drive our cars everywhere. We didn’t do X, Y, or Z. That was the government. Yes, but we also didn’t vote, write letters to our representatives, or exercise any of our civil rights for the sake of justice. When we are in love, we are willing to sacrifice of ourselves for the happiness of another. We do not count the cost. We do not do so grumbling. It is out of love that we do everything in our power to alleviate the pain in the other. If we find that this step is particularly difficult, that we’re unwilling to give up the luxuries of our lifestyle, it is not that we do not care or that we are bad people, it is that we have yet to make a loving connection with people affected by our lives. A “cause” will not convince someone to give up their life but a person will, especially if we take Jesus’ words seriously: “Whatever you did for one of the least of these brothers [and sisters] of mine, you did for me” (Mt 25:40). For if we truly saw Jesus in the sick and suffering, and knew that we were responsible for his suffering in any way, wouldn’t we do everything we could to change our lives? That is the pinnacle of social consciousness, the point to which each of us strive as Christians. While I identify one more stage to this progression, I want to leave it in parenthesis because, frankly, it is not something everyone is called to (or even should be called to). We find in figures like Francis of Assisi and Mother Theresa a complete self-identification with the people they served. Not only did they understand and share the feelings of the poor, they lived them completely as the poor, refusing to accept distinctions between themselves and the people they served. The took on the material sufferings of the people around them so completely that they began to see themselves as poor too. They were reckless and cared little for themselves, and were criticized for such then and now. Maybe they were. Maybe they should have taken better care of themselves so that they could have helped more people. But then again, maybe their witness is the witness for us all: when you see Jesus in your brothers and sisters, how can you help but drop everything to be like him, leaving behind the worries of the world? I didn’t know who the author was until I read everything. God Bless you, Casey. Some really good thoughts from my friend, Fr. Casey Cole, on how we become human…and fall in love!